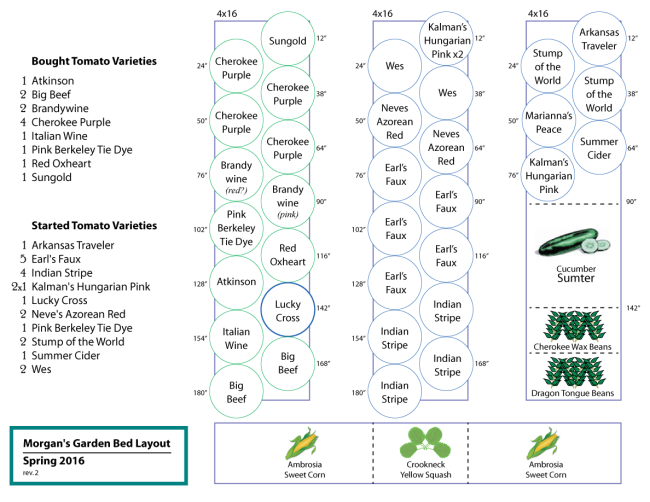 If you’re curious about this year’s garden plan, here’s the details. I’m definitely tomato-heavy this year. If I end up putting a zillion jars of sauce, then I will back off and try other crops next year. The broccoli, brussels sprouts, and leeks at the remote garden were absolutely sublime and I don’t want to miss an opportunity to grow them. I’d also like to squeeze a few parsnips in somewhere. I’m glad I didn’t do it this year though as the winter was unseasonably warm. Parsnips benefit from several hard freezes. 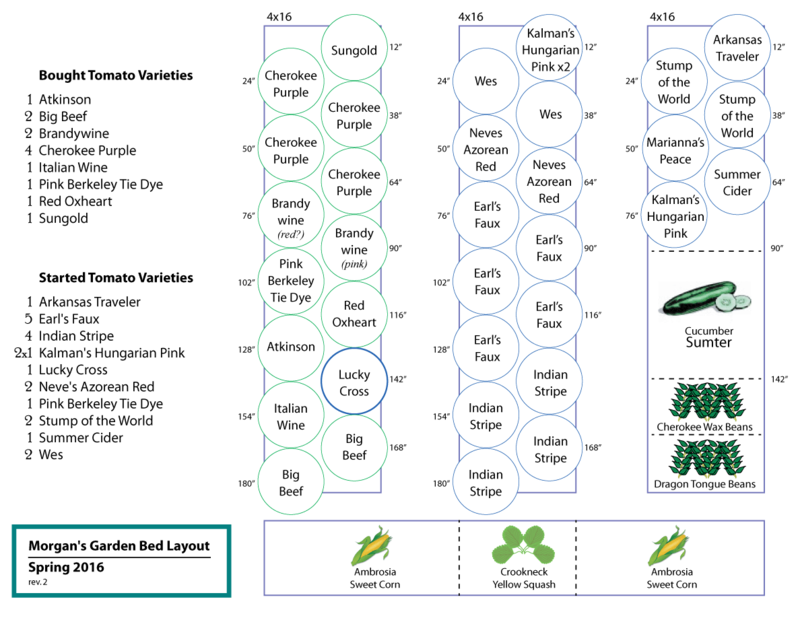 For tomatoes, I’m growing Arkansas Traveler, Atkinson, Big Beef, Brandywine, Cherokee Purple, Earl’s Faux, Indian Stripe, Italian Wine, Kalman’s Hungarian Pink, Lucky Cross, Marianna’s Peace, Neves Azorean Red, Pink Berkeley Tie Dye, Red Oxheart, Stump of the World, Sungold, Summer Cider, and Wes. I’m growing Ambrosia sweet corn (a 1990’s hybrid bicolor), Crookneck Yellow Squash (I ran out of seed of Delta but I will be sure to order some for next year — it was so tasty!!). I’m trying Sumter cucumbers for sweet pickles this year. They’re not pictured but I am also growing numerous peppers in pots. Four Carmen peppers (sweet), two Socrates (sweet), a Poblano (for chile rellenos) and Anaheim (not sure but should be fun! ).